A design process that included over 300 email messages, Skype calls and text messages resulted in this one-of-a-kind 12 foot trailer. A Victorian sofa becomes part of a black leather and silver mini-studio for our musician client. Flocked wallpaper, stainless steel Deco-era wall sconces, re-purposed aluminum trailer skin and black-dyed oak paneling help round out the look and feel. Polished and ready to go, this image has become part of our annual Halloween greeting. Wide whitewall bias-ply tires with bullet moonies. 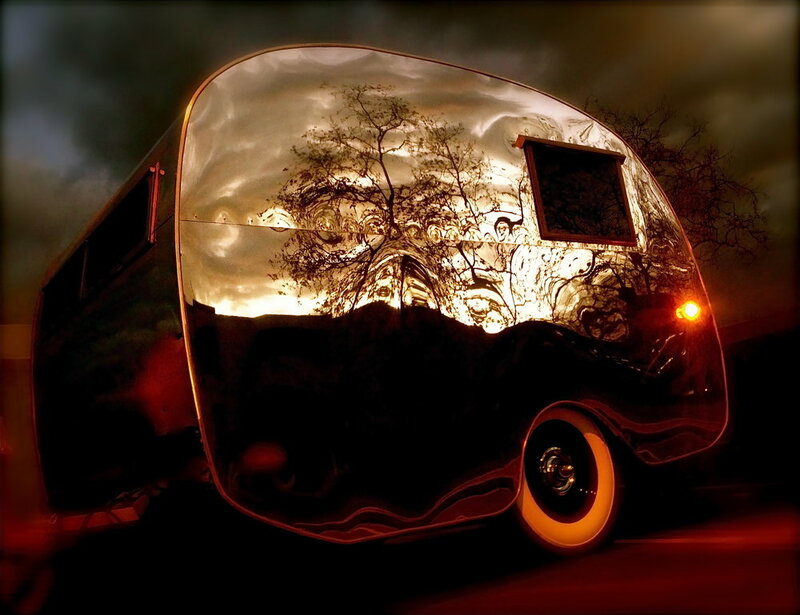 Black, white, silver and chrome were all that this trailer needed to stand out.